Starting life as a Moorcroft painter whose hair often changed colour as much as her artistic work, Vicky Lovatt quickly became known in Moorcroft circles for her affinity with astronomy, planets and the universe, all wrapped up in a Pre-Raphaelite flavour. The Pre-Raphaelites were a secret society of young artists (and one writer), founded in London in 1848. They were opposed to the Royal Academy’s promotion of the ideal as exemplified in the work of Renaissance master Raphael. Inspired by the theories of John Ruskin who urged artists to ‘go to nature’, they believed in an art of serious subjects treated with maximum realism. Their principal themes were initially religious, but they also used subjects from literature and poetry, particularly those dealing with love and death. So too the Moorcroft designer. Vicky has an innate desire to investigate anything from the macabre to the evocatively beautiful, often, raising her subject matters to the night sky as a backdrop. Indeed, her bird, animal and fungi designs hold much of the mysterious. 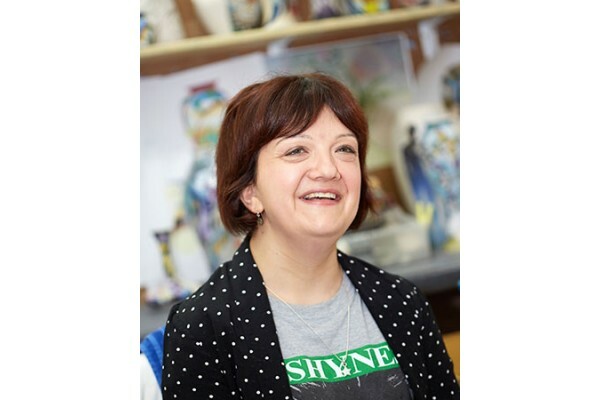 One of Vicky’s career highlights was designing nine different giant floral ceramic globes, a first for Moorcroft, for a medal winning RHS Chelsea Flower Show garden, each capturing the flowers planted within the garden itself. Not only did Vicky excel in the creation of a cacophony of floral colour and movement, but she later used the globe design to map out the celestial realm in Pillars of Creation. Unsurprisingly, Vicky would even master Gustav Holst’s The Planets in a design for an event at Thaxted, the second home of the great composer. With many great artists, it is often easy to detect realms of inspired thought and structure in their early compositions – this is probably as true for Beethoven as it is in the realm of the Applied Arts, where a potential for brilliance is exposed in their early work. Consequently, from time to time, Moorcroft have had a great response from offering designs from members of our Design Studio under the caption ‘Before They were Famous.’ This week the signs of astounding creativity and academic prowess can be seen in some of Vicky’s early pieces that are now available to purchase. The Lady of Shallot holds Vicky's sheer passion for Lord Tennyson (c. 1832) and her ability to capture the very essence of a poem, art or piece of literature. Vicky, by nature, likes to absorb herself in her projects. Indeed, she is even known to have immersed herself quite literally in a cold stream to capture the dying Ophelia with flowers draped around her for a College project! This would later benefit Moorcroft in the Lady of Shallot design released at Cannon Hall, Yorkshire, now a Museum and Art Gallery with links to the Pre-Raphaelite Brotherhood through Evelyn De Morgan. Vicky is a designer whose work connects the venue of Moorcroft events following her desire to delve into great depth. The Lady of Shallot is one of the treasured pieces from Vicky’s illustrious archives that are offered for sale. This poem would later go on to inspire one of Vicky’s most famous ranges for Moorcroft – Ophelia’s Flowers. The Lady of Shallot is a magical being who lives alone on an island upstream from King Arthur's Camelot. Her business is to look at the world outside her castle window in a mirror, and to weave what she sees into a tapestry. She is forbidden by the magic to look at the outside world directly. In much the same way, Vicky’s design work arises from nature but is, more often than not, a woven tapestry of wonder. Twilight Bonnets is another design that is offered for sale this week and holds the hallmarks of Vicky’s design work. Ink caps pummelled and pulled into a design that holds the mysteries of forest in swathes of violet and eerie pinks. Vicky is not, however, a designer who simply roams in the gothic. Named after the delicate Duchess of Rivoli, these vibrant hummingbirds with iridescent green and magenta red feathers were the forerunners of Vicky's eye for the vibrant, fleeting wonders of the natural world which would later spark a collection inspired by the birds of Costa Rica. Here you may find your imagination recalling the distant sound of tropical birdsong, the gargling of amphibians or even the delicate flutter of insect wings. Set against a black ground to allow the drama of colour to take centre stage, the Duchess of Rivoli holds the hallmark of elegance as well as an excellent eye for colour. So there it is. Why not see for yourself some of the designs that form part of Vicky’s exciting repertoire.